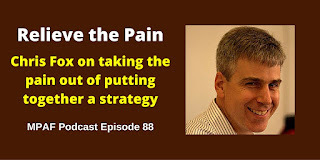 Roger Edwards recently recorded a podcast with me on taking the pain out of putting together a strategy. Why many strategy processes engender fear and scepticism, and what you can do about it. The four key phases of strategy development and execution, and what typically goes wrong at each. How StratNavApp can help teams to design and execute better strategies that are more likely to deliver meaningful change. You can click on the 'play' button below to give it a listen. Marketing Protection and Finance (MPAF) Podcast Homepage to check out some of his other great content, and maybe even subscribe to future podcasts.